There's no doubt that the Microsoft Surface Studio is one of the most powerful and one of the most stylish all-in-one computers out there – it's a gorgeous-looking powerhouse of a machine that is enough to tempt any Windows fan who can afford the high asking price. The question is, what's Microsoft going to do for a follow up? It risks getting left behind if it doesn't refresh the Surface Studio line – Apple has a brand new iMac Pro on the market to tempt users – and here are all the Surface Studio 2 rumours and speculation you need. The original Surface Studio was first unveiled back in October 2016, and two years is a long time in technology. As that two-year anniversary ticks round, the Studio starts to look more and more dated, as impressive a computer as it is. Could Microsoft be planning another hardware event for this October? We wouldn't bet against it, and the company might use the opportunity to refresh some of the other devices in the Surface line, including the Surface Laptop. Even the devices that aren't really due an upgrade, like the Surface Pro, might get a small specs bump or a different kind of refresh (like new configurations or colours). There's a good chance a new Surface Studio will be out before the end of the year then, but at what cost? The original computer currently sells for a starting price of a cool £2,999/$2,999, and we'd say it's unlikely that the next generation is going to go much beyond that. This is a serious bit of kit for serious users. As impressive as the Surface Studio specs are, they're now starting to look a little on the dated side: one way that Microsoft could refresh the all-in-one is by fitting the latest 8th-generation Intel Core i5 and Core i7 processors inside. The GeForce GTX 965M and GTX 980M GPU options could do with being replaced as well. RAM currently tops out at 32GB which even in 2018 is still more than enough for even the most demanding users, and it's speedy LPDDR4 RAM at that – better memory chips won't be available this year, so there isn't much room for Microsoft to pack in much of an upgrade here. More local storage would also be welcome. The Surface Studio screen currently tops out at a 4,500 x 3,000 pixel resolution – it's one of the reasons why the computer looks as good as it does – but we reckon Microsoft could go even further here and upgrade the screen to a 5K model on the Surface Studio 2 (the iMac Pro manages 5,120 x 2,880 pixels, by the way). 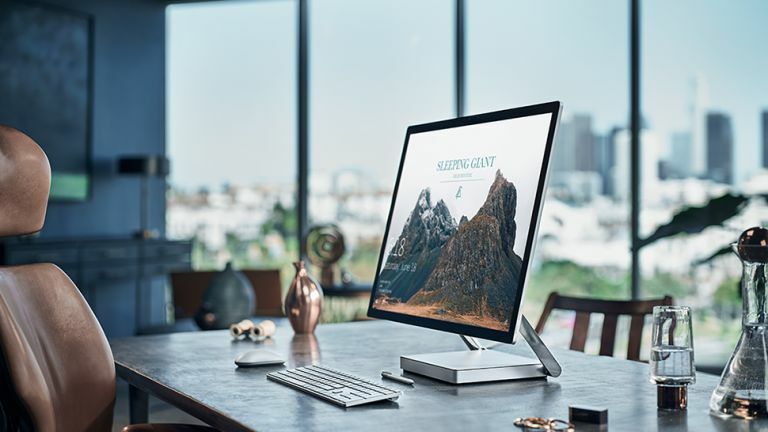 Most all-in-ones are impressive-looking bits of kit, and the original Surface Studio certainly fits that description, with its sleek lines, subtle colours and hinged design that allows the screen to be laid down almost flat. It's unlikely that the Surface Studio 2 is going to deviate too much from that design template. Hardware can always be made thinner and more compact of course, which would mean an all-in-one Surface Studio 2 that offers even less of a desktop footprint than the current one. We've seen a few fantastic concepts of what the upgraded hardware might look like, but so far nothing in the way of leaked images, so it's difficult to say with any degree of confidence how the Surface Studio 2 might look. Even the accessories looked the part with the original Studio and it's difficult to imagine how the design might be improved. We're sure Microsoft is going to come up with some aesthetic tweaks and improvements, but we'll have to wait and see. We've heard rumours that a Surface Studio 2 is on the way, but rumours about what it might actually bring with it are actually pretty thin on the ground. Don't expect Microsoft to revolutionise its approach to the all-in-one computer with anything too innovative. There might be something Microsoft can do with the ports of the Surface Studio, giving Thunderbolt 3 and USB-C fans something to work with, but in general the message is probably not to mess too much with a winning formula. Once again the Surface Dial should be present and correct, perhaps with a few tweaks of its own. We're looking forward to whatever Microsoft has got in store, and with signs that the original Surface Studio is running low on stock, we might not have to wait too long to get a look at what's next. As always, we'll bring you all the news here.